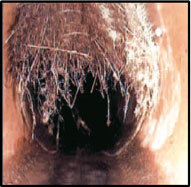 Once inside the pipe, tree roots will continue to grow and if not disturbed, they will completely fill the pipe with multiple hair-like root masses at each point of entry. 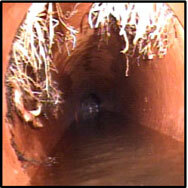 The root mass inside the pipe becomes matted with grease, tissue paper, and other debris discharged from the residence or business. As roots continue to grow, they expand and exert considerable pressure at the crack or joint where they entered the pipe. The force exerted by the root growth can break the pipe and may result in total collapsing of the Drain. The best way to stop tree root blockages is by Herbicide Tree Root Foaming. We've seen it all! Anything you can imagine has usually found it's way somehow into a drain, the list is basically endless. We have been dealing with stuck objects in drains for years, we have invented all sorts of contraptions to deal with these issues. The Best way to deal with foreign objects in your drain... Call Us, it's what we do.